Not only does it exist, but it also is one of the 3 most valuable collections in the world, along with the Crown Jewels in the UK and Imperial Crown Jewels of Iran. The Moscow Diamond Fund is like a “state within a state” with its own rules, set by the Ministry of Finance. Since the information available about it on the Internet is limited – and sometimes inaccurate – we found it necessary to clarify some questions and tell how you can visit Diamond Fund on your own. No advance arrangements required for unguided visits. Tickets are bought at the entrance to the Diamond Fund, inside the Armoury Museum building. Sorry, no official guided group tours in English (in Russian only). However, that does mean you can visit it any time, during the Diamond Fund opening hours. The exhibition of the Diamond Fund is accessible via the Borovitskaya Tower (translates as Pine-grove Tower). If you’re going from Four Seasons Hotel and Red Square area, walk through the Alexander Garden to the end of the Kremlin wall. It takes about 8-10 minutes. the Tomb of an Unknown Solider (Eternal Flame) – it will be to your left. a bridge which connects Kutafya Tower (the white one) with the Kremlin. Kutafya Tower is the main Kremlin entrance. the Kremlin Ticket Office – on the picture below. Skip it and continue in the direction of the green arrow, if you're not going to visit other museums or have already arranged one of the guided Kremlin Tours English. a recently established monument to Emperor Alexander I (yes, the park is named after him). 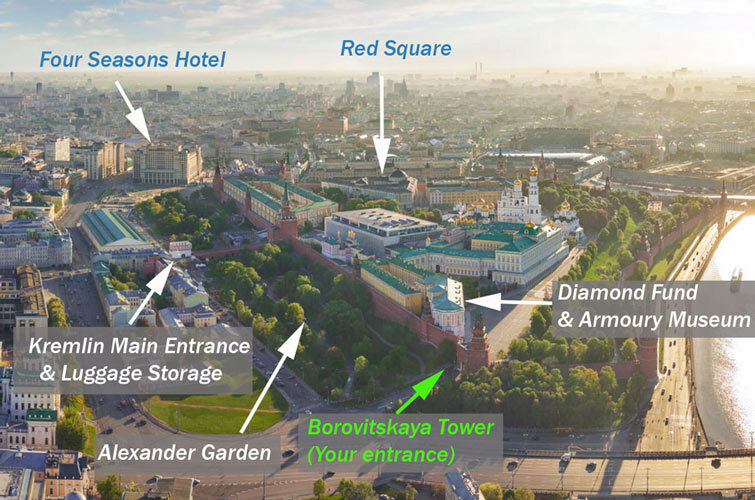 At the entrance, your bag will be checked thoroughly (make sure to leave backpacks and large bags at the Kremlin Baggage storage), when asked for a ticket say that you are visiting the Diamond Fund. You will be let through the gates, without a ticket. Sometimes, when the entrance is too crowded, you will be offered to enter the Kremlin via Kutafya Tower (main Kremlin entrance). Though there will be a bit of extra walking, it will still help save some time and – even if you don't posses a ticket to the Kremlin territory – allow you to visit it free of charge! The closest building to the entry is the Armoury Museum. The exhibition you’re going to visit is inside it, on the ground floor. At the entrance you will be met by one of the Kremlin officers (what a service!) who – once again – will ask you about the purpose of a visit. sometimes there is a line at the entrance to the building itself (where the green arrow is pointing). You should NOT be in that line. Russian citizens can visit Diamond Fund with a guided tour only, at certain entry times and are waiting for it. Overseas travellers can enter the museum at any time, during the Diamond Fund opening hours. Just try to get closer to the entrance, so that the Kremlin Officer notices you and lets you in. to visit the Armoury Museum Moscow or the Kremlin Territory & Cathedrals separate tickets are required. Once inside, get a ticket. Currently, it is 500 Rubles per adult. Children get a discounted ticket. Between October and April you will be offered to leave coats at the checkroom. Taking pictures inside is not allowed, unfortunately. To buy a ticket you need cash (Rubles). Credit cards are not currently accepted. A visit to the Kremlin Museums will be more fun and a whole lot easier with a professional and friendly guide. Book one of our Kremlin Tours English! Enjoy your visit to the Diamond Fund Russia!